Bésame Cosmetics Classic Color Lipstick in Noir Red 1930 & Portrait Pink 1963. The Bésame Cosmetics Classic Color Lipstick retail for $22US or $27CAN for 0.12 oz 3.5g of product. Bésame Cosmetics Classic Color Lipstick box. Bésame Cosmetics Classic Color Lipstick new box label. 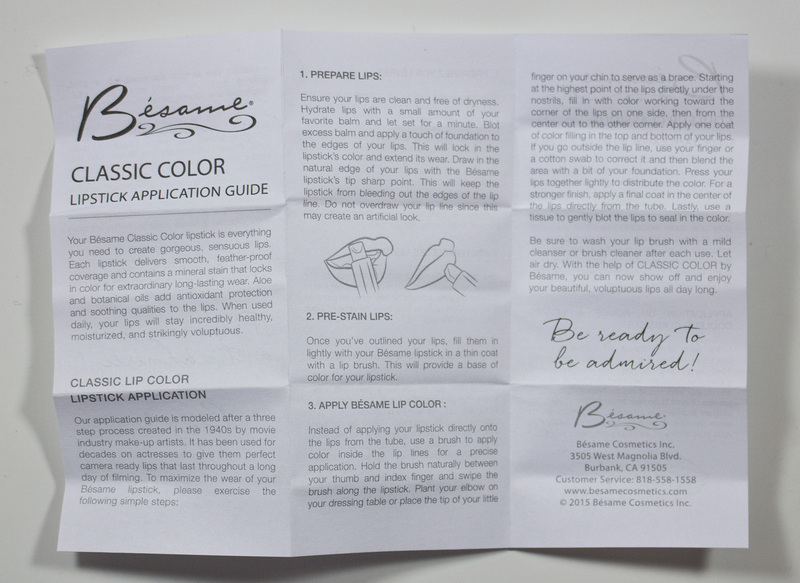 Bésame Cosmetics Classic Color Lipstick new label box. Bésame Cosmetics Classic Color Lipstick in the history of labels C201 Portrait Pink 1963 (pre 2015), C210 Cherry Red 1935 (2015), and C214 Noir Red 1930 (2016). I did find the Noir Red was the most creamy in texture on the lips. Noir Red 1930 is a deep merlot red with a matte finish. Portrait Pink 1963 is a light baby pink with a matte finish. 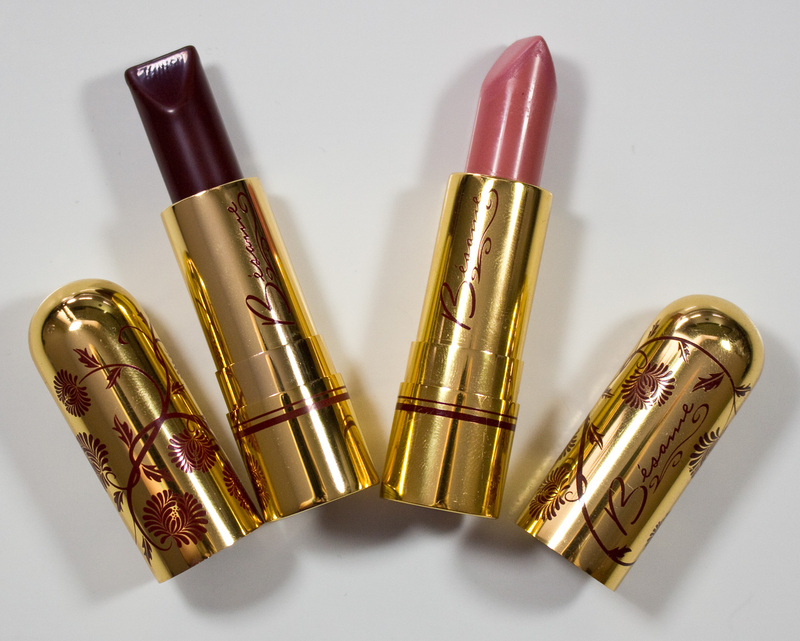 Gold round bullet tube with the Bésame flowers in red and is a touch shorter but 1cm than most lipstick bullets on the market giving it that vintage size feel. The closure also has a nice and tight snap. 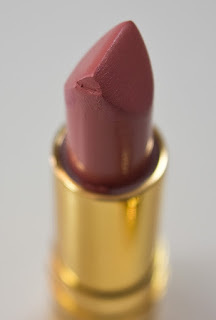 Bésame Cosmetics Classic Color Lipstick in Portrait Pink 1963. 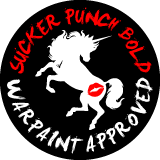 Aka, don't put the cap back on until the bullet is completely screwed down because the snap closure is in the top of the cap and can and will dig into the lipstick bullet. Again I have not had this issue with the other two shades I own, so I hope it was just a packaging glitch. 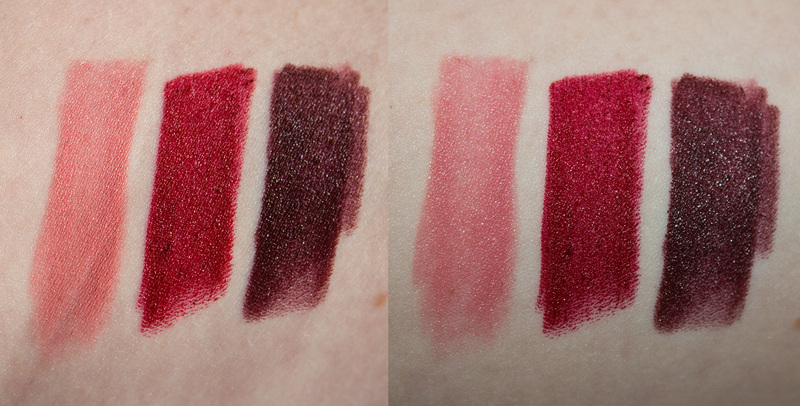 Daylight and Flash swatches: Portrait Pink 1963, Cherry Red 1935, & Noir Red 1930. One of the nicest higher end lipstick products without bleeding into that $30CAN plus price point.